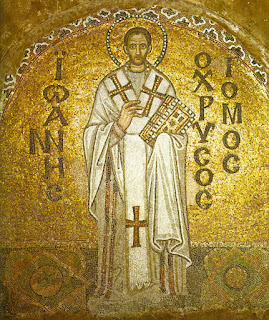 Today is the Feast of the Translation of the Relics of St. John Chrysostom. Thirty years after St. John's death in exile, St. Proclus, Patriarch of Constantinople, persuaded the Emperor Theodosius II (A.D. 408-450) to allow the relics of St. John to return to Constantinople. The emperor’s mother, Empress Eudoxia, had sent St. John into exile because he, as the Patriarch of Constantinople, openly criticized her vices. Theodosius issued an edict for the return of St. John’s relics; however, those sent to retrieve could not lift his reliquary. It was not until the emperor wrote a letter of apology and humbly asked the saint to return that the reliquary was able to be moved. 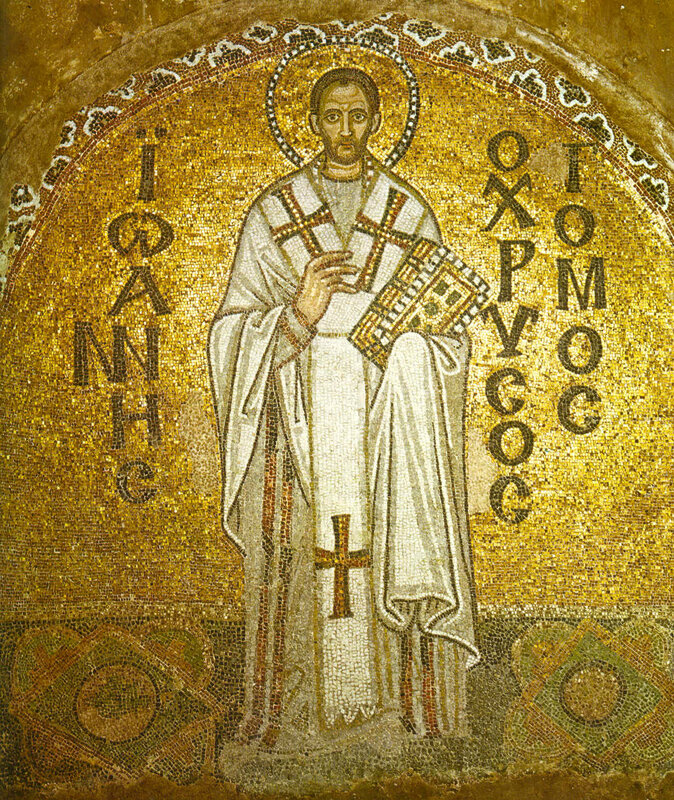 The moniker “Chrysostom” means Golden-mouthed because St. John was a gifted homilist. Fortunately for us, St. John is one of the most well-documented saints in the history of the early Church. We have more of his writing than just about any other saint, including his analysis of the Gospels according to St. Matthew and St. John as well as the Letters of St. Paul. There is a story of St. John from the time when he was writing on St. Paul that a man who had come to see the saint was turned away because St. John was seen to be meeting with someone at his writing desk who was leaning over and whispering into the saint’s ear. This went on for three days. When St. John openly wondered at what had happened to the man, who he had arranged to meet, those around him became aware of the icon of St. Paul hanging over St. John’s desk and realized that the person they saw whispering in St. John’s ear was St. Paul himself. To this day, that ear remains incorrupt (and I can attest to that because I have seen it myself). St. John looms very large in the life of the Orthodox Church, because the liturgy we do most of the year is attributed to St. John. Indeed, because of the large number of surviving writings by St. John, modern textual analysis confirms that the Anaphora of the Liturgy of St. John Chrysystom was indeed written by St. John himself. It is a rather humbling and awesome thing to pray his words knowing that 1600 years of Christians before me have prayed the very same thing. It is a reminder that in our present age, we delusionally believe we have progressed beyond our forbears. While we may have some pretty amazing technology at our fingertips, human beings knew just as much (if not more) about being human hundreds and even thousands of years ago. St. John’s writing is as relevant today as it was in the 4th century. My daughter recently had to read Thucydides for school. I challenge anyone to read that with “United States” in the place of Athens and “Soviet Union” or “China” or “North Korea” in the place of Sparta and be able to tell me that (beyond the technology involved) that the conflict was any different. We doom ourselves by ignoring the wisdom of those who came before. In a way, this is why the OSR has been so important for this hobby. We refuse to ignore the past. Indeed, some of us insist that past versions of D&D are better than what came after. I count myself among them. I recently got back together again with some high school buddies of mine to play. Despite a lot of talk about how good 3.5 is and how we all should give 5e a go, we ended up going back to B/X because the wisdom there just cannot be ignored. I pray we all apply this axiom beyond the gaming table. Pick up a classic and realize that humanity has always been human (both wise and foolish) and that we have a lot to learn from those who came before. Today the initiates were very excited when news came from town that a yellow robed mage was visiting Headwaters. I must confess that I was rather giddy myself. My own interest in alchemy always had me curious as to the differences between my hobby and the arcane. Had I lived closer to the influence of the Mage’s Guild I might have chosen a different vocation. Imagine everyone’s surprise and delight when the mage himself showed up at the monastery with a letter of introduction asking for an audience with Fr. Valinor. Lord forgive me, but my curiosity got the better of me and I went to see the man himself as he waited on our kindly village priest. Despite being travel-worn, he seemed a rather respectable fellow whose ruffled appearance could not hide what many would consider to be a handsome countenance. The most striking thing about the man, however, was the owl that so calmly sat upon his shoulder. There was a majesty and intelligence behind those eyes I had never seen in an animal. It made me wonder if the rumors of mages having magical animal servants were true. Lord, forgive me for eavesdropping, but I managed to overhear Fr. Valinor exclaim something about his friend Tarlo as he was glancing at the letter and leading the yellow mage into his chambers. In our excitement at such an event, many of the initiates (including myself, I am afraid to say) were speculating why Fr. Valinor had chosen Cuinn to be the yellow mage’s chaperon. The half-elf had long abandoned the path of an initiate to help the Rangers of the Order of the Archangels patrol the area for any humanoid incursions. Were they planning some kind of expedition? Why, Lord, couldn’t I have been chosen? Why, Lord, did you have to listen to my prayer? I have been asked by Fr. Valinor to accompany Cuinn and the yellow mage to Redwraith on a fact-finding mission. There was a great battle there a few months ago and no one knows what is happening now. When I protested, Fr. Valinor insisted that it was time for me to get out and see the wider-world before I settled down into my lab and take my vows. When I insisted that I was still needed because of the disease that still afflicted the camel herds, he reminded me that we had plenty of my elixirs in storage. He even insisted that I take one with me! The monastery is abuzz getting our supplies ready for the journey. We must carry all of our own equipment and food, since the camels are not healthy. This doesn’t seem to bother either Cuinn or the yellow mage, whose name I have discovered is Morivam. He hails from Trisagia and has the habit of finishing my sentences, as if he knows what I am about to say. It might seem rude, but he has never misconstrued any of my intentions. Our band of explorers has picked up two additions. Tenel of the Delver Clan will add his sword and halfling expertise with a sling to our endeavor (which makes me feel slightly less anxious about the coming days); however, I cannot say that I am happy about a mysterious fellow who only showed up in town recently. His name is Holton and despite having a chronic cough, boasts that he know the wilderness area around Headwaters well. Lord, forgive me for being suspicious, but I have heard rumor that a bandit crew was recently put down by the Paladins of the Order but one or two managed to escape. I wonder if that is not the real story behind this fellow. We leave tomorrow early. I must admit, the part of me that isn’t terrified is rather excited. Oh, what a terrifying and exhausting three days this has been! After an feet-stinging first day of trudging through the hill country north of Headwaters, Cuinn asked me to take the second watch, considering I was used to getting up in the middle of the night to pray. Not long after wiping the sleep from my eyes, I realized that there was movement all around the camp, beyond my ability to see clearly. I woke Cuinn, knowing that his elven blood allowed him to see more clearly at night than I. He quickly roused everyone from sleep and insisted that we retreat post-haste. Just as I began to realize that we were in danger, arrows came raining in from the sky, and we heard a battlecry and the sounds of metal on metal. It took me several moments to realize that two of the arrows had hit their mark, both into the back of poor Tenel. Thank Isten he was still breathing, but he was in no shape to move. If he were to survive, we had to make a stand, at least long enough for me to use my magical healing. I did not see what happened next, but when I had done my work on Tenel and he was back from the brink of death, there were several sleeping goblins around us and I heard the sound of several more retreating into the dark. Unsurprisingly, Holton was ready to slit the creatures throats when Cuinn and (surprisingly) Morivam stayed his hand. It was decided that we would disarm the goblins and then put as much distance between us and them during the rest of the night. When the sun rose, it revealed to us a camp of gnolls punishing a group of goblins (were they the same that attacked us the previous night?) They did not spy us, so it was our turn to rain missile fire. One was felled, and the goblins turned tail. As the gnolls charged, Holton appeared behind one and managed to kill it with one well-placed thrust of his blade. Their charge thus blunted, the rest fell easily to our own blades. Realizing we were still not safe from the roving band of humanoids, we wandered far and wide looking for a defensible piece of ground we could use as a camp and some much needed rest. Cuinn reported that he had found something suitable, but it was already occupied (something about leaving a hippogriff mother alone being the better part of valor). Lord, give me strength! If I thought the last several days were frightening, I was sorely mistaken. Cuinn noticed movement ahead of us today, which turned out to be three giant spiders. This was a strange sight. Not that no one hadn’t heard of the existence of such creatures. On the contrary, they are quite common in the jungles south of Headwaters. Seeing them out in the open, so far north concerned us all. The half-elf warned us that these creatures were known to be surprisingly intelligent, so when they split off in three directions, Cuinn was not only not surprised, but surmised that they might be circling around to flank us. We decided to follow the trail of one that veered of to the East. We came upon the creature clinging to a rock face. I was not prepared for its size: the abdomen was likely five feet long, but then it began to speak! It accused us of spying on them for the elves, noting that he could smell Cuinn’s elven blood. Fortunately, it seemed uninterested in a fight unless we insisted on one. We were able to convince it we were not the spies it suspected us to be. None of us were prepared for the realization that these creatures were intelligent enough to have language. Knowing that they also appeared to be going toward Redwraith has us all worried about what exactly we are heading into. Today is the Feast of St. Euthymius the Great who was born in Melitene in Armenia to faithful parents about the year A.D. 377. His parents were older and barren. They received a vision and conceived in their old age. His parents died shortly after he was born and he was taken in by the bishop of Melitene. He was tonsured as a monk and ordained as a priest. In this role, the bishop placed him charge of all the monasteries in the city. St. Euthymius, however, yearned for the life of a hermit and left for the wilderness. What follows is a typical pattern of great monastic saints: they go out into the wilderness, attract the attention of the faithful through their piety and the miracles performed through them, a community with a monastery at its center forms and the saint goes off to the wilderness and the pattern repeats itself. One of the monasteries that St. Euthymius founded in this way was in a cave situated on a cliff overlooking a gorge in the desert of Coutila. Despite its terrifying location (one, BTW, that would make a very interesting encounter area for a campaign), it became the location of a monastery and was very popular with the villages in the surrounding area. He converted a tribe of Arabs. Their leader was ordained and became known as the Bishop of Tents (an interest FRPG title, if I’ve ever heard of one). There are several great saints that were taught and/or influenced by St. Euthymius including St. Theoctistus (Sept. 3), Symeon the Stylite (Sept. 1) and St. Sabbas the Sanctified (Dec. 5). He foresaw his death at the age of 82 and passed on January 20, A.D. 473. The lives of monastic saints like St. Euthymius are, in many ways, one of the reasons I believe the framework of D&D works so well within a Christian context. The monastic is the adventurer who goes out into the Wilderness (Chaos) to make it safe for Civilization (Law). In Leviticus, Aaron is commanded to cast lots on two goats. One is sacrificed as a sin offering, the other is presented alive for the atonement of sins and sent away into the wilderness of Azazel. The name Azazel literally means “rugged of God” which emphasizes “wilderness.” According to the Book of Enoch, Azazel is a fallen angel and leader of the Watchers — he is a demon. Thus, the wilderness of Azazel is a demonic wilderness. This is the origin of the word “scapegoat” — the sins of the people are placed upon the goat and sent into the Demonic Wilderness to feed the demons in place of people. Thus, especially since Cain is exiled there, the Land of Nod is the place where demons live. The first great wave of monastics went into the deserts of Egypt — the wilderness where demons reside — in order to fight the enemy in their own territory. Again, this is the model for the classic D&D campaign: the adventurers go into the wilderness full of monsters and humanoids in order to fight the enemy were they live. Upon clearing the wilderness of theses monsters, they build a Stronghold and thus make it safe for Civilization. Then the pattern repeats itself again and again. 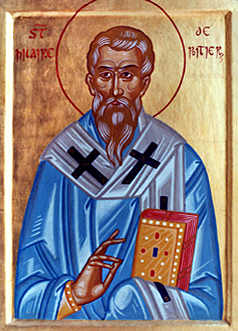 Today is the Feast of St. Hilary of Poitiers. Born in the 4th century A.D. of pagan parents in Gaul (modern day France), he was trained in philosophy and rhetoric. In his adult life, he saw the weaknesses of a pagan world-view and embraced Christianity. In A.D. 350 he was elected bishop of Poitier were, along with St. Athanasius the Great (who was his contemporary), defended the Orthodox Faith in a sea of Arianism. In other words, most of Christendom under the leadership of the Arian Emperor Constantius believed that Christ not only did not share the same nature as the Father but that there was a time when the Son was not. In contrast, St. Hilary insisted that the three persons of the Holy Trinity were of one nature. In A.D. 355, the Emperor required all of the bishops to sign a letter condemning St. Athanasius. St. Hilary refused and was sent into exile in Phrygia, which is in west-central modern-day Turkey. It was there that St. Hilary wrote his seminal work On the Trinity. The Emperor soon found that having St. Hilary in such close proximity to the capital was actually causing more trouble than it was worth and St. Hilary was returned to his see in A.D. 360 where he served until his death in A.D. 368. St. Martin of Tours was his protege and after founding a monastery near Poitiers continued St. Hilary’s legacy when elected to be bishop of Tours in A.D. 370. Many years ago now, JB of B/X Blackrazor asked the question Wherefore Art Thou Religion? In response, I declared Religion Art Right Here where I detailed some of the default fantasy analog for Christianity I use in a lot of my campaigns. This post, however, does not explain the Trinitarian nature of the Istinite God. I delve into my thinking on this with this Saintly Saturday post on St. Athansius himself. This is all a prelude to adding to this tapestry of a fantasy analog of Christianity by taking an early Christian hymn attributed to St. Hilary and passing it through the metaphoric engine I proposed based on the paradigmata of St. Athansius the Great. And heaven is light once more. And in our darkness shine. Lead us till life is done. Thus, in order to make this hymn an analog, it is necessary to shift the metaphor and images from Light vs. Dark to Law vs. Chaos. Lead us to life everlasting. And thus, an analog hymn for my fantasy analog for Christianity based on the work of St. Hilary of Poitiers is born.